Finally a DIY recipe for your four legged mates! Our DIY natural dry dog shampoo is suitable to use on dogs of all ages (note essential oil caution below). It is free from harmful chemicals, synthetic ingredients and plastic packaging. Combining soothing bentonite clay, cleansing and conditioning Moroccan lava clay and pest repelling neem oil, our DIY dry dog shampoo will keep your dog’s coat soft and manageable, as well as deter fleas and other insects. Find the recipe and ingredients below. *The essential oils used in this recipe are known to be generally safe for dogs in small amounts and for dogs over 12 months old only. If your pooch has sensitive skin, broken or infected skin in any way, omit all essential oils. Cats are much more susceptible to essential oils so avoid using this dry shampoo around cats. Combine all the dry ingredients in a glass bowl. Mix together with a wooden spoon. Add the neem and essential oils if using and mix in. Strain the mix through a fine sieve to remove clumps and get a nice fine powdery consistency. Store in a jar with a shaker lid or reuse an old baby powder style container. 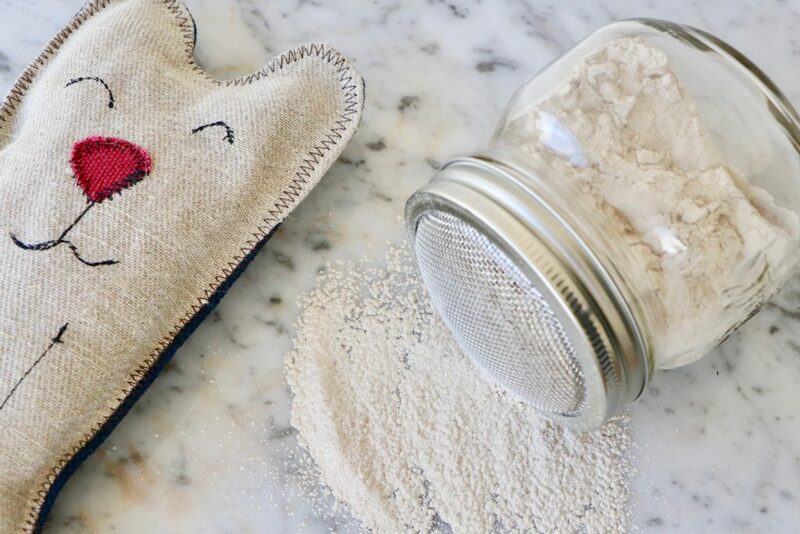 Give the jar a shake before each use to loosen the powder. Use this dry dog shampoo twice per week or when needed. Especially helpful in summer. Do this outside in the garden as it will get messy! Sprinkle a good amount over your dog’s coat starting from the neck and working down the back. Massage in with your hands. Concentrate on areas prone to heat, such as under the legs, belly, bottom and under neck. Even between the toes. Avoid eyes, nose and mouth. Let your pooch shake off the excess dry dog shampoo and then brush the rest out. Tip: This DIY dry shampoo for dogs is only helpful in summer to help control fleas, but handy during the winter months to keep their coat clean and fresh when it’s too cold to wash your dog outside. Please do not use on cats. Store in a cool dry place. Use within 12 months. This recipe makes enough dry dog shampoo to approx. fill 1 x 440ml mason jar.